The Album Release Party for The Pope of the People. JPII’s favorite Polish treats will be served! Note: If you are out of state or can’t make it to the event, you can purchase a copy of the CD or DVD at the web site. This musical was performed at our Parish. While I was unable to attend, my favorite deacon did. He thought that is was wonderful. Tom Quiner is a faithful Catholic and an all around nice guy. Please support his efforts to evangelize by using his musical gifts. 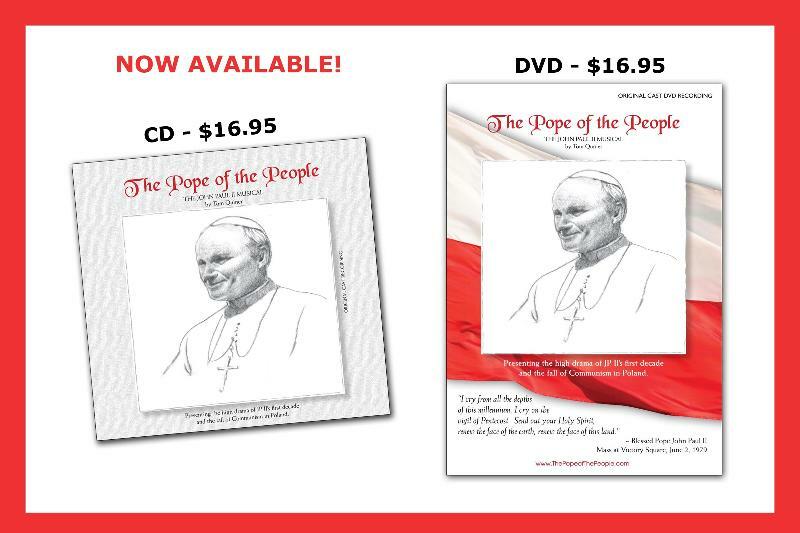 You can order on his website, The Pope of the People. This entry was posted in Catholic Church and tagged Christian music, Des Moines Catholic event, Pope John Paul II. Bookmark the permalink. Thanks for posting this, Susan. It should be fun. Karen is making some home-made Polish treats, including JPII’s favorite: Polish Papal Cream Cake. When folks walk into Divine Treasures, they will immediately see a table of books about Pope John Paul II, including “John Paul the Great,” by Peggy Noonan. It was her book that was the original inspiration for my musical, The Pope of the People. Hope your readers stop in to swap their favorite JPII stories. What an amazing man!